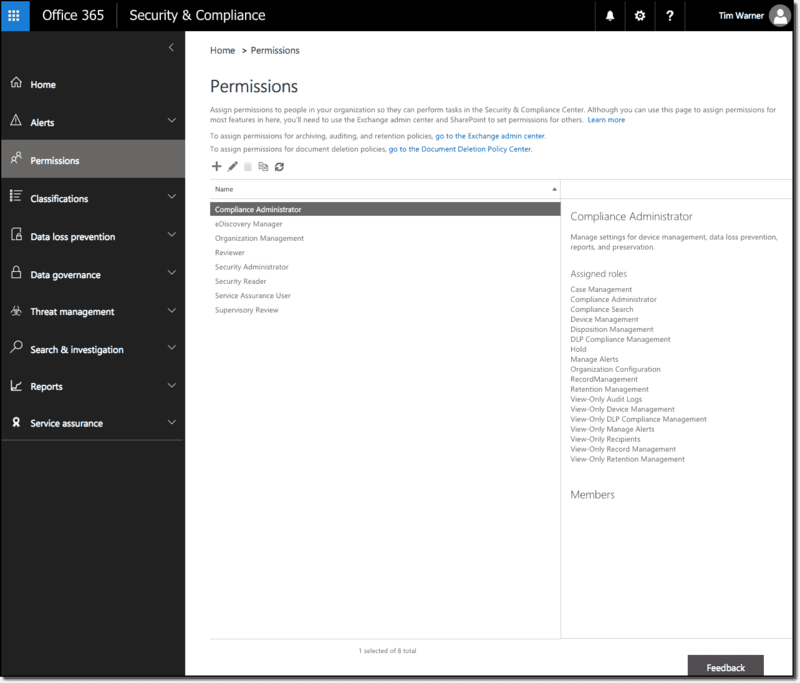 This article will give you an overview of office 365 security and compliance center through which you can centrally manage your Office 365 tenant security and compliance lifecycle. On one hand the Office 365 administrator needs to manage the different Office 365 services by using separate admin centers. On the other hand, you have (a) your users save enormous data volumes to the Office 365 tenant; and (b) compliance requirements that mean you need to secure, audit, and document the above infrastructure. Whoa—that is a lot of stuff to worry about! Fortunately, the Office 365 development teams gave us the Office 365 Security & Compliance Center. From the Office 365 admin center (https://portal.office.com), open the Admin center menu and select Security & Compliance. The Security & Compliance Center opens in a separate browser tab as shown next. The direct URL to the site is https://protection.office.com. The Security & Compliance Center uses a role-based access control (RBAC) authorization model just like the other Office 365 services use. The roles and permissions you assign here grant users permissions only to the Security & Compliance Center. The use case here is that you could, for example, grant select Legal team users membership to the built-in eDiscovery Manager role, and Compliance team users membership to the Compliance Administrator role. Of course, you can define your own custom roles if you wish. Next, let me show you some of the more important tasks you can accomplish in the Security & Compliance Center. In this article I'll show you some of them; you should certainly consult the documentation for full information. Another thing you'll want to do is navigate to Service assurance > Dashboard and give Office 365 your business' geographic location and industry. When you provide Microsoft with that data, Office 365 gives you compliance reports and trust documents customized to your business. Pretty awesome! 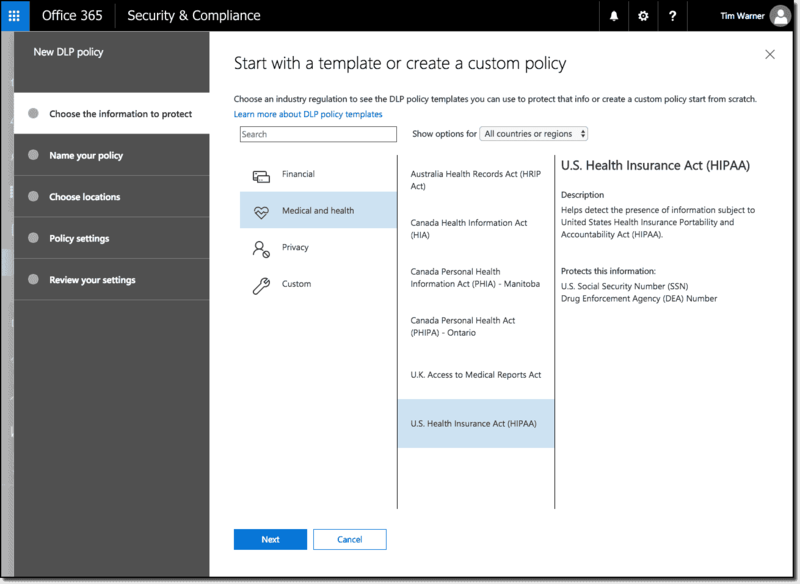 NOTE: You need to assign your compliance officers' Office 365 user accounts to the Service Assurance User role in Permissions for them to access the compliance reports. The alerting function in the Office 365 Security & Compliance Center is a huge value to administrators because it proactively informs us when particular actions occur within the tenant. 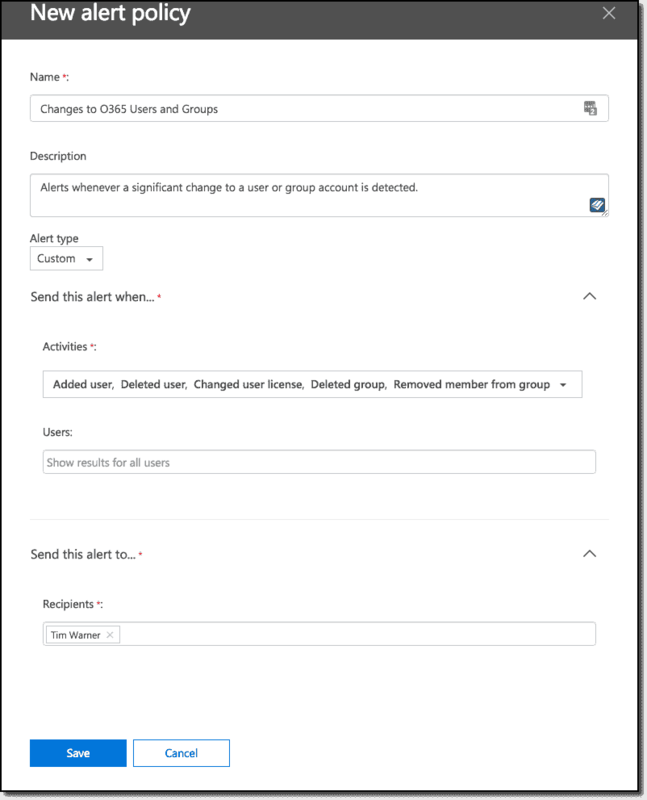 The New alert policy dialog shown in the next screenshot asks you to pick (a) which activities across the Office 365 services you want to watch; (b) which users, or all users, you need to scope the alert to; and (c) to whom you want to send the alert e-mail messages. 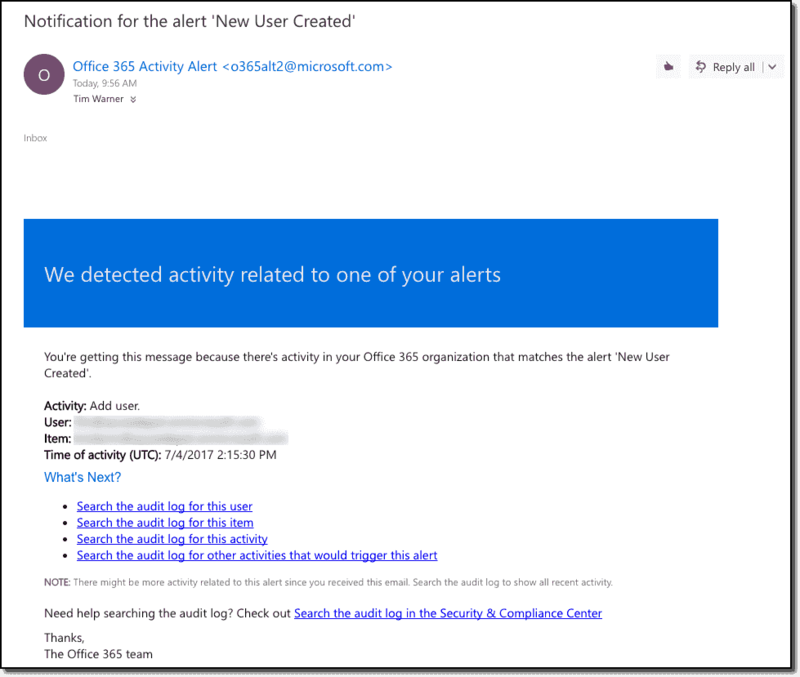 Office 365 sends the alerts to its notification (bell) menu, targeted email addresses, as well as to the View security alerts page in the Security & Compliance Center. The following screenshot shows you what a representative email alert looks like. DLP in Office 365 combines the best parts of Active Directory Rights Management Services (AD RMS) and the Intune device management product. Whereas configuring AD RMS on premises is a giant pain in the you-know-where, configuring DLP in Office 365 is wizard driven and remarkably straightforward. The heart of DLP is the policy, which I show you in the next screenshot. Depending on your industry and security/compliance requirements, you may need to take special actions on sensitive data like patient records, financial numbers, and so forth. A DLP policy can cover multiple data sources, such as Exchange Online, SharePoint Online, and OneDrive for Business. You can restrict access to data the policy identifies, including (a) notifying the users of any actions they need to take on the sensitive data; and (b) preventing users from copying, forwarding, and performing other actions on that data. You can run DLP reports from the Security & Compliance Center by navigating to the Reports > Dashboard page. 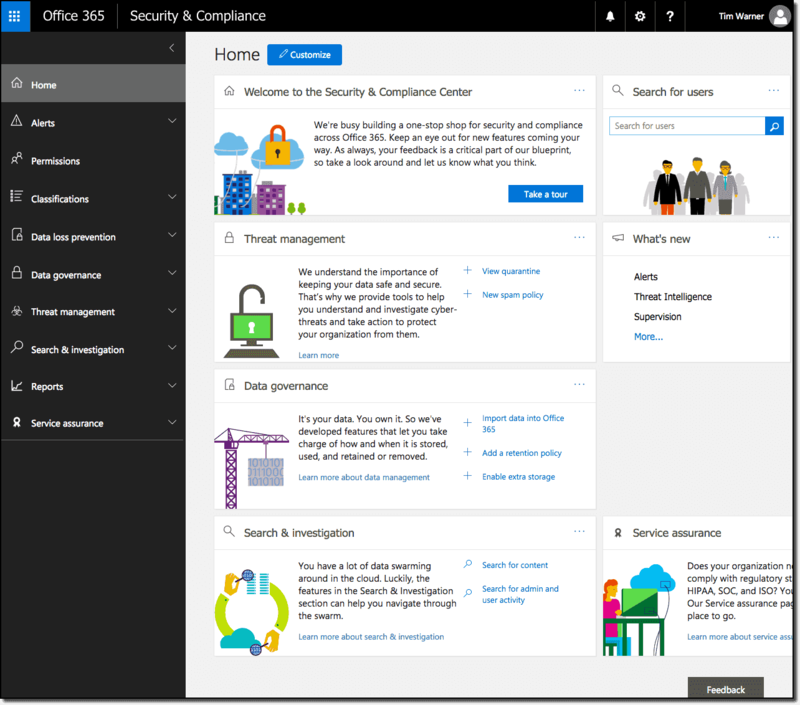 There's so much to see in the Office 365 Security & Compliance Center! Let's finish up by learning how to connect to the center with PowerShell. The bad news is that the Office 365 PowerShell story is a royal, confusing mess. So many modules, so many versions—it's gross. The good news is that we can actually use PowerShell remoting to establish a direct connection to the Office 365 Security & Compliance Center. This module is pretty big (148 functions as of this writing), and you can perform most security/compliance tasks using them. Overall, I found that once you get past your initial learning curve, the Office 365 Security & Compliance Center gives you excellent insight into your tenant. In my experience, managing Office 365 can sometimes feel like a bad game of "Whack a Mole" given how many moving parts there are. We hope that the Office 365 product teams will continue the trend of unifying the Office 365 control plane because we all (Microsoft, our business, and we as individuals) are better off for it.